One of the biggest hassles when traveling is packing for you trip – from fitting all of your clothes into your luggage to arranging multiple suitcases in your vehicle. Avoid the stress and hassle with the CarFit Stylish Car Roof Cargo Carrier Bag. To provide long-lasting strength and use, this cargo bag is durably made using premium, heavy-duty PVC. This material is resistant to weathering, rotting, chemicals and abrasion, and boasts extremely good tensile strength. As a result, it will hold up against everyday wear and tear. In addition to its strength, the thick, two-layer cargo bag is waterproof to keep your luggage protected against the outdoor elements. Ensuring that no water seeps into the bag, your belongings will stay dry despite wet weather conditions. Easy to use, the car roof bag safely secures to the roof of your car with high-quality straps. The CarFit comes complete with two different sets of straps – one set that can be used with a roof rack while the other is meant to be used with a car roof that isn’t furnished with a rack – to accommodate everyone’s needs. You can efficiently pack all of your luggage inside the CarFit without taking up excess space inside your vehicle. It provides 15 cubic feet of storage space to fit all of your gear in one convenient location while freeing up space so family members aren’t cramped in the car on those long road trips. Not only is the cargo bag designed to allow for smooth airflow above your car to improve gas mileage, but it also boasts a stylish design. Now you can travel with style and have enough room to stretch your legs to boot. HIGH-QUALITY MATERIAL. 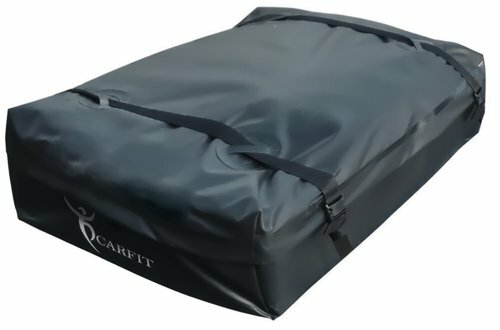 The CarFit Roof Cargo Bag is expertly crafted from premium, heavy-duty PVC material to provide long-lasting strength and use for years to come. The material boasts extremely good tensile strength along with resistance to weathering, rotting, chemicals and abrasion to hold up against everyday wear and tear. WATERPROOF CARGO BAG. Protecting your luggage against wet weather conditions, the thick, layered cargo bag is waterproof to ensure that no water seeps inside. As a result, your luggage stays dry as if you were transporting it in the trunk of your vehicle. CONVENIENT STRAPS. To accommodate everyone's needs, the CarFit comes with two different sets of straps to safely secure the carrier to your car. There is one set that can be used with a roof rack as well as a separate set of straps to be used with a car roof that isn't furnished with a rack. OPTIMAL DESIGN. The bag is designed to allow for smooth airflow above your car to improve gas mileage when you're traveling. In addition to its exceptional quality, the cargo carrier boasts a stylish design so you don't have to travel with an eyesore on top of the car. AMPLE STORAGE. Providing 15 cubic feet of storage space, you can easily pack all of your luggage inside without taking up excess space in your vehicle. Use the extra room you have so family members can stretch their legs on those long road trips to your travel destination. If you have any questions about this product by CarFit, contact us by completing and submitting the form below. If you are looking for a specif part number, please include it with your message.